BRENTWOOD, N.Y. -- More than a dozen members of the MS-13 gang have been arrested in connection to the murder of two teenage girls and a third teenager last year, law enforcement announced Thursday. 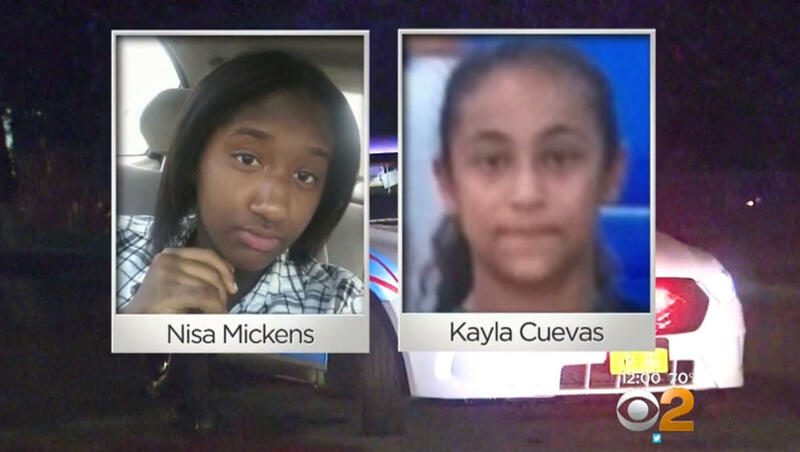 According to Robert Capers, the United States Attorney for the Eastern District of New York, 13 defendants are being charged with seven murders, including the deaths of 15-year-old Nisa Mickens and 16-year-old Kalya Cuevas, whose bodies were found in September 2016. In addition to the murder charges, Thursday’s indictments include racketeering, assault, arson, conspiracy to distribute marijuana and firearms charges. “For far too long on Long Island, members of MS-13 have been meting out their own death penalty,” said Capers. CBS New York reports that on September 13, the day before her 16th birthday, Nisa Mickens’ brutally beaten body was found on a tree-lined street. The next day, the beaten body of her lifelong friend, 16-year-old Kayla Cuevas, was discovered in the wooded backyard of a nearby home. “The murders of these teens are particularly disturbing,” said Capers, who described the killings as being perpetrated by “MS-13 gang members swinging bats and machetes.” He said that Mickens was so badly beaten around her head and face that she was barely recognizable. The discovery of Mickens’ and Cuevas’ bodies was the first of several teen deaths in the Brentwood area that are believed to be gang-related. In September 2016, police also discovered the skeletal remains of 19-year-old Oscar Acosta and 15-year-old Miguel Garcia-Moran in a remote industrial area of the town. Acosta had been missing since May, and Garcia-Moran since February. In October, the skeletal remains of 18-year-old Jose Pena-Hernandez, who police said was a known MS-13 gang member, were found in a wooded area near the Pilgrim Psychiatric Center. When asked about the immigration status of the defendants, Capers said that 10 are in the country illegally, two have green cards, and one is a U.S. citizen.